Goodbye, universities, offices, and stores. Hello, comfy chairs and caffeine. Coffee is the fuel of the modern world. When Europeans began drinking less ale and more caffeinated beverages in the 17th century, and talking about ideas rather than just seeking a break from manual labor, the Age of Enlightenment was born. Today, in many American cities, there are coffee shops on every corner, whether they’re independent cafes or Dunkin’ Donuts or Starbucks. Amid all the business and institutional models that are changing in the face of our growing ability to do everything online, the coffee shop alone seems secure: an irreplaceable gathering place full of beverages that cannot be downloaded. This fact is not lost on those businesses and institutions that are struggling. And, probably wisely, they are all beginning to remake themselves in the coffee shop’s image. What we are about to witness: the coffeeshopification of everything. College is becoming untenably expensive in the United States. Having a college degree means that you are much more likely to find good employment — but tuition and other costs have far outpaced inflation for decades. As the debt required to get an education rises, students and their families face a question: What’s the advantage of a good job if the salary difference is lost to student debt? Now, imagine a personnel manager at a mid-sized corporation who’s looking for an employee with some particular knowledge. There are two candidates: one with an appropriate college degree from the local state school, a second with relevant MITx certificates. Let’s say all other things between the candidates are equal. Which should the manager choose? Given the caliber of professor at MIT, the online student may have learned just as much. The candidate who went to college probably enjoyed his experience more, but the potential employer is unlikely to care about that. Finally, there’s the financial reality: To some extent, the student debt of the job candidate dictates his salary requirements. If the MITx candidate has the knowledge required and far less student debt, he probably can be hired more cheaply. Ultimately, the cheaper option will win. So what might happen to our local colleges? Eventually, some of these campuses might become places where students who use MITx and other programs seek tutoring, network, and socialize — reclaiming some of the college experience they’d otherwise have lost. What used to be a college campus would now be essentially a giant coffee shop. E-books are coming of age — for many reasons. You can keep your personal library and your bookstore in your pocket. You can annotate and share your e-book notes within social networks. Writers can publish more directly to their audience. Once completed, the unit cost for each e-book sold is essentially $0. Those savings can be (and sometimes are) passed on to the customer. Nothing ever goes out of print, because there are no print runs. And an e-book doesn’t have to be limited to the written word: It can incorporate video, audio, and other methods of presentation. Compare that with your local Barnes & Noble. Those stores are huge, but they can accommodate only a small fraction of the titles available in, for example, the Kindle e-book store. They require expensive real estate, buildings, and employees. One practical innovation: Bookstores are starting to feature print-on-demand technology, like the Espresso Book Machine, which can print a book within minutes. But there’s no need for a huge store for that. Copies of bestsellers could be kept on a few shelves — everything else would be available for print. What do bookstores offer that online doesn’t? Well, a space to gather, comfortable chairs, readings and other events, community, and people to recommend books to you in person. 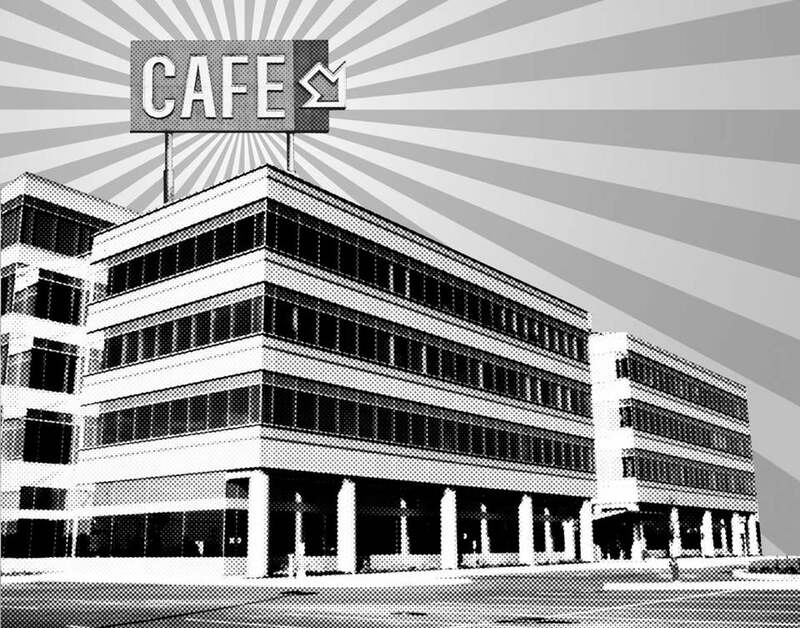 Increasingly, they also feature cafes. Between e-books and print-on-demand, the huge big-box bookstores will eventually shrink to fill just those needs — a coffee shop with a few shelves, a few printers, and an author signing books over in the corner. This year, I did 90 percent of my Christmas shopping through Amazon Prime. The product selection online is better than that of even the largest retailer. And I was able to shop anywhere I wanted: I could sit and drink a latte at Starbucks while calmly shopping on my laptop. Another factor will soon change retail even further. On the horizon is a time when fewer products will be mass produced in factories. 3D printing, a technology still in its infancy, will allow products to be manufactured made-to-order close to the consumer. Imagine the 3D print shop of the future: You put in your order, probably from your smartphone, and then go pick it up. What does the lobby of such a business look like? A coffee shop. Just a few years ago, it was a rare person who could afford the computers, printers, telephones, fax machines, and mailing and shipping equipment needed to do business. The collective office simply made economic sense. Now, however, a single person with $500 can duplicate most of the functions of all that office equipment with a single laptop computer. With the proliferation of laptops and smartphones, the remaining function of the office is to be that place where clients and colleagues know to find you , and where kids and other distractions of home can’t. This separate space is the primary thing we’ll look for in the workplace of the future, along with a new kind of flexibility. Groups for one project will form and disband; then a new group will form for the next project. What will that workplace look like? Probably like a coffee shop, one that features conference space and cubicles for rent. What Doesn’t Become a Coffee Shop? I would have said that the last holdout will be houses of worship, except that the church I grew up in now has a coffee shop. The church buys Land of a Thousand Hills coffee to aid war-ravished Rwanda, and the profits go to missions. What will remain other than coffee shops? Upscale retail shops, where customers go as much for the experience as for the goods purchased, will remain. Restaurants will remain. Grocery stores will remain. Theme parks will remain. Other brick and mortar retail stores will be converted to multi-use public spaces, which will be in high demand by mobile workers and students. Of course, it wouldn’t hurt if these spaces also served a decent cup of coffee. Stephen T. Gordon practices law in Shreveport, La. This piece was adpated from a post on Speculist.com, where he blogs and podcasts.